One of the saddest scenes to see on the news is the sight of devastation resulting from a natural disaster. In towns, states and countries where hurricanes are expected, it makes sense to prepare ahead of time. Hurricane tarps and covers could save you from some of the damage and expense caused by this amazing force of nature. 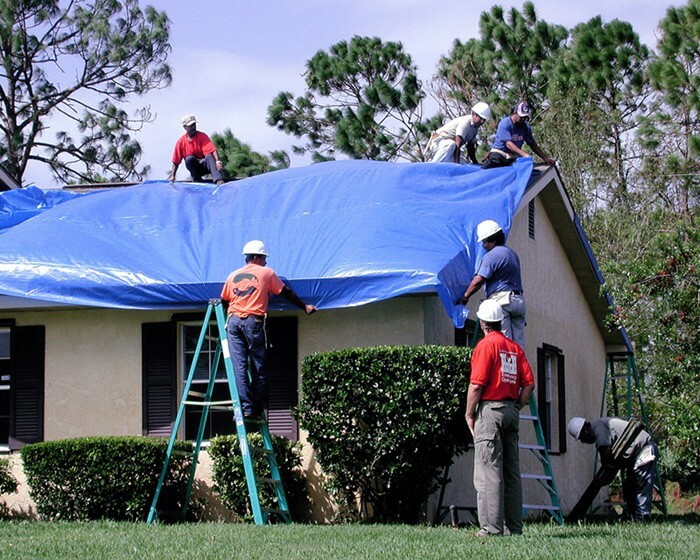 Hurricane tarps are made in many sizes to fit a small shed or even the roof of your home. Spread something fifty feet square to protect roof tiles. Opt for a ten by twenty foot tarp to keep the backyard play house in one piece. Cut a patch to a hole created during the storm to keep rain and debris away from causing further damage. Even place coverings over windows before an event to prevent items flying through the glass, or to cover breakage caused by falling trees or flying objects. Materials should pass government standards if you are going to buy them: check for these first. You want something with a thick weave, water proof and tear resistant. The tarps include synthetics such as polyethylene. When preparing for an event, you might tie them down securely. Most houses seen from above sporting these covers show up bright blue. Armies use tarps too, but their color choice tends to be brown, especially if they want to blend in. The issue here is not style but strength. Look for not just the material, but also eyelets and rope to be strong. Along with wind damage, consumers might also endure fires. Is your tarp fire retardant? Even ask for a tarp to be made to your specifications. If a hurricane is coming and you are not ready, act fast. Order quickly. Many warehouses keep a large stock of tarps for emergency purposes, which is when most people want them. Bulk orders tend to yield discounts which means good news for emergency preparedness groups and government agencies.